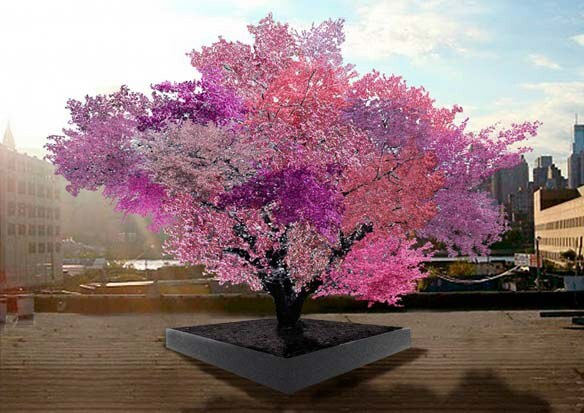 Look at this amazing fake-looking pink and purple tree. Would you believe it was made by an artist who grafted different kinds of fruit trees together to make not just a mind-blowingly beautiful piece of tree-sculpture-art, but a magic tree that (spoiler alert!!) bears 40 kinds of fruit for months on end? Each tree begins as a slightly odd-looking specimen resembling some kind of science experiment, and for much of the year, looks like just any other tree…Then, over the course of several months, Van Aken’s trees produce an incredible harvest of plums, peaches, apricots, nectarines, and almonds, including many you’ve likely never seen before. Right now there are 16 of his trees around the country, producing 40 kinds of fruit each. That means they’re producing…[MATH-RELATED EXPLETIVES DELETED]…quite a lot of fruit. Everyone knows that if a cool tree-project falls in the forest and no one’s there to record a TEDTalk, it’s almost like it never happened. Luckily someone was around to record Sam Van Aken’s TEDTalk which is great, because Aken is one super-creative human.